Synopsis: Eating a healthy diet is important for our health but this can sometimes be challenging. Eating healthy means not just knowing what and how to purchase those healthy foods but also how to prepare them once you have them. With this in mind, Family Medicine started the R.I.P.E. program - Residents Improving People's Eating - to provide both education and access to local, healthy fruits and vegetables for family medicine patients. The program is simple. Residents provide a "prescription form" to targeted patients who can then redeem the prescription at one of two local farmers' markets in return for vouchers to spend on fruits, vegetables, and nuts. 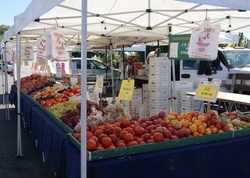 In addition, third year resident, Mary Clegg, coordinated several group visits which included patients meeting with a dietitian and then taking a field trip to the UC Davis Medical Center farmers' market to shop for food. Patients received information on how to shop at farmers' market, seasonal vegetables, and healthy recipes. One group visit even included a cooking demonstration by Debbi Kennedy from the Ditch-the-Drive Thru program which focuses on "delicious nutritious meals in less time than the drive thru!" (http://ditchthedrive-thru.com) .